Despatch: From 28th April 2019. Mondeo: Asparagus Mondeo is a very impressive, very early, all male hybrid asparagus which we have found produces impressive yields of juicy spears. The spear tips remain tight throughout the season and asparagus plants have proved to have an excellent disease resistance. Suitable for harvesting as white or green asparagus. Guelph Millennium: Asparagus Guelph Millennium was bred in Canada at the University of Guelph, this all male asparagus variety has exceptional vigour and gives exceptional yields. Perfect in combination with asparagus Mondeo as it crops later. Guelph Millennium is perfectly suited to our climate - even cool damp conditions - and is possibly the hardiest asparagus available. 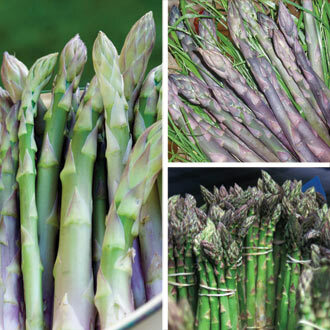 Asparagus Guelph Millennium grows well in a variety of soils and has now become one of the most widely grown asparagus varieties worldwide. Pacific Purple: This New Zealand-bred, purple speared, mid season variety is sweeter, more tender (on account of its low fibre) and higher in antioxidants than green types. It is also high yielding and absolutely delicious. So tender, it can even be eaten raw if desired. Even a small asparagus bed is a worthwhile, long-term investment, which will reward you with succulent spears early every summer for 10 years or more. It is also much easier to plant and to grow than many people think! Years ago it used to be grown in specially prepared raised beds, but today’s modern hybrid varieties perform really well ‘on the level’ and on most well drained soils. Try to pick a sunny position, removing all perennial weeds and as many stones as possible prior to planting. Full planting and care instructions are included with every order.